There are 72 games at the State Fair of Texas. All of them boast giant, colorful, plush prizes. A fairgoer attempts "Bottle Up," the game where you basically use a fishing pole with a ring affixed to the end of the line to stand up a glass bottle. The Correa family shows off their unicorns. 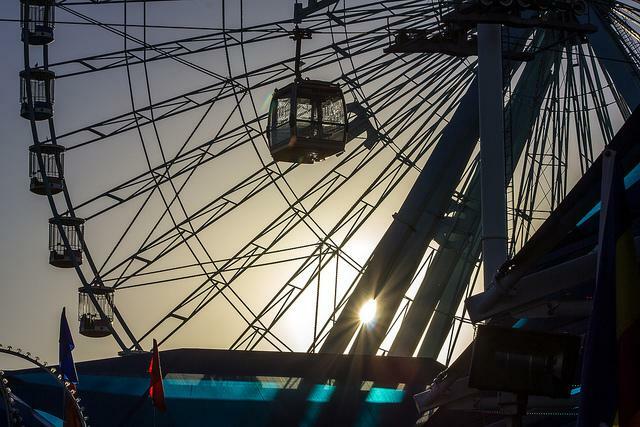 By the time you pay for admission, parking and a corny dog… a day at the State Fair of Texas is getting pricey. Throw in a few attempts at a midway game and you can practically hear the dollars flying from your wallet. There’s just something about trying to knock over milk bottles with a baseball or scoop a prize duck from the pond that’s hard to resist. Bells and whistles of the midway aside, the game operators themselves are pretty chatty. They pick on tall guys, daring them to sink a basket. Or heckle parents with kids in tow, promising a prize for the whole family. Andre Evans brings 25 of experience to the fair. A game operator named Andre Evans has been at the fair for a quarter century. Today he’s manning an old favorite, that game where you try to smash a plate with a baseball. He’s so charming, he’s got a lot of takers and his philosophy is pretty simple. “What I want my people to do is have five dollars worth of fun, win, lose or draw,” Evans says. “So I’m going to give you an example ok? Hey! Watch this pretty girl right here! Watch this! She’s about to tear up something!” Evans shouts at the top of his lungs. In case you were wondering, the pretty girl in question missed. Over at Kentucky Derby, a game where how accurately you roll a ball into a hole determines how fast your racehorse charges, Lucy Jones was lucky number 2. “This is the first time I’ve played in probably 30 years!” Jones laughs. Her winning strategy? “I threw it fast and often,” she says. Lucy Jones and her prize, Gizmo. For her prize, she chose a stuffed Gizmo toy. You know, the good little creature from the 1984 movie, Gremlins. Hisham Elsherbini scored a Gizmo too, after breaking a plate to smithereens with a well-aimed pitch. “Well, I went back to my baseball, peewee baseball days. I used to be a catcher. And did I ever tell you guys I played high school football too?” says Elsherbini. The array of plush prizes at this year’s fair is diverse, to say the least. Texas Longhorns dressed in head-to-toe burnt orange. Fluorescent penguins in snow caps. Oversized Curious George dolls, chubby cows, even giant stuffed bananas wearing lipstick. Elizabeth Correa wasn’t going to quit squirting water at a target until all three of her kids had pink and white unicorns as big as toddlers. “You have a lot of chance, 10 percent you’re gonna win. So keep trying until everybody gets one,” says Correa. That’s what game operators are banking on. As long as fairgoers have a stuffed Scooby Doo or inflatable sword in their sights, there will always be someone to ring the winner’s bell. Five stories that have North Texas talking: Fall means two things – pumpkin treats and the State Fair of Texas; the Texas Enterprise Fund is under scrutiny; once upon a time, Dallas tried to build a port; and more. 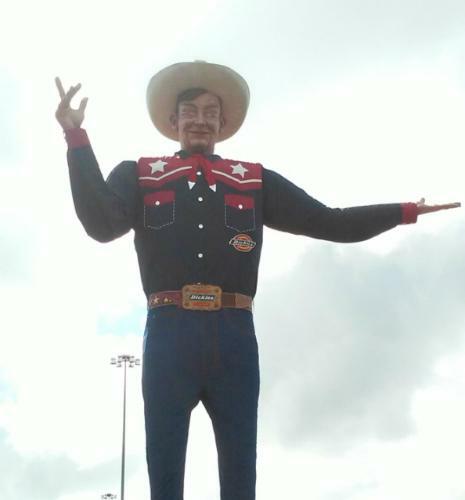 Big Tex is one of the most iconic features of the State Fair of Texas. It’s been dubbed the quirkiest landmark in the country, after all. The oversized cowboy just became a little more awesome in this video. The country’s “quirkiest landmark” is back. 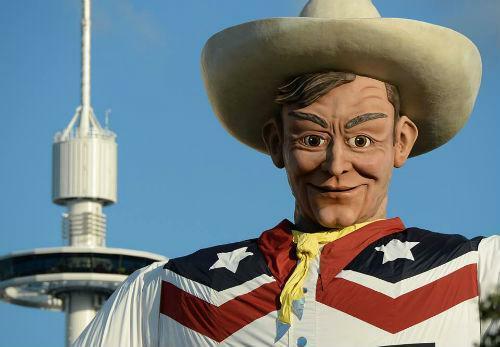 Big Tex made his annual reappearance today in Fair Park. The 55-foot cowboy sported a brand new navy shirt with red pockets and white stars, a flipped color palette from last year, and tailored boots and jeans. The State Fair of Texas has released a complete list of all of the new foods that will be served this year. They include pork rind nachos, fried sweet tea, fried chicken and waffle cone, and something called "Amazeballz."